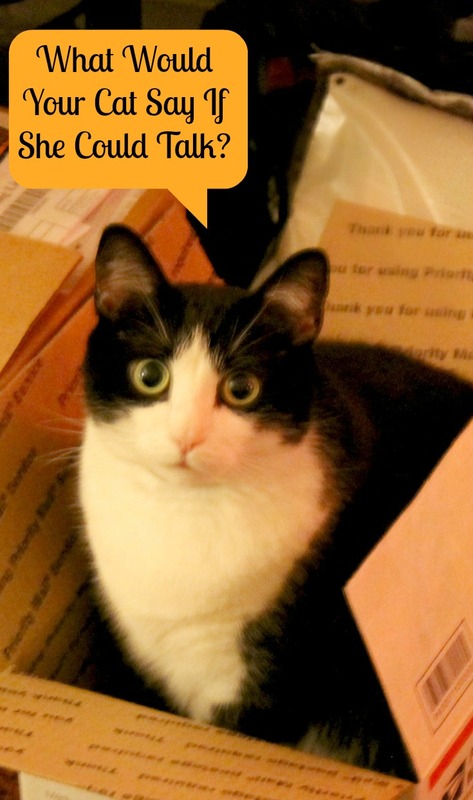 Home Current Sweepstakes If Your Cat Could Talk, What Would She Say? Today is National Answer Your Cat’s Questions Day and when I saw this, I was very amused! Not only did I think it was funny there was a day reserved to observe this but it made me think of my cats. My cats are two sisters, Meep and Fat Hazel and they are just a joyful pair of cats to have. You can read more about them in my post Top Holiday Gifts For Pets Who Have Everything. I firmly believe these cats were destined to be part of this family and they could not be any different. Meep is the demure, petite and agile cat while Hazel is big, pretty chubby, apathetic and darn right lazy. In summary, Hazel is a girl after my own kinda chubby, pretty apathetic and loving to be lazy self. I decided to give you a glimpse into the world of Fat Hazel and the conversations she and I have on a daily basis. Hazel: Coldly stares from her perch on my legs, which went numb hours before…says nothing. She is not a morning feline. She is lucky I am as much not a morning person as she and hate getting out of bed, so I comply to her request. Five minutes turn to ten, which finally turn to 20. After dragging her furry and expansive body out of my bed, she ambles down the hall and eats, watching me make coffee out of the corner of her eye. I dropped the creamer once and she will never let me forget it. Shes know it was not a once in a lifetime thing, so she waits for the day I will do it again and she will lap it up before I can clean it. For a cat who ambles through life, she can book it when it comes to food! I take my coffee to the sofa, get my laptop and open it on my lap (cuz duh, that is why it is called a laptop) and stretch out my legs. Hazel has already wolfed down her food and makes her self comfortable on my legs. When I work, this is where she stays…until I have to pee or get more coffee, which usually go hand in hand. Then I get more dirty looks until I decide to stop with the coffee and settle into working for an hour or so. I get up to make myself breakfast. Hazel decides since she is up anyway, she will follow me into the kitchen where she sits by her food bowl and watches me. Me: It is my turn to stare. Speaking of food, if Hazel does not get a treat every day, she gets more annoyed than usual. I feel best giving her a snack which is made from safe and all natural ingredients like those from Dr. Harvey’s Healthy Formulations. They have food and teats for your Dogs, Cats, Birds, and Horses and are all natural, chemical free, and nutritious and are all made in the USA. They have essential vitamins and supplements to keep your furry friends at their healthy best. 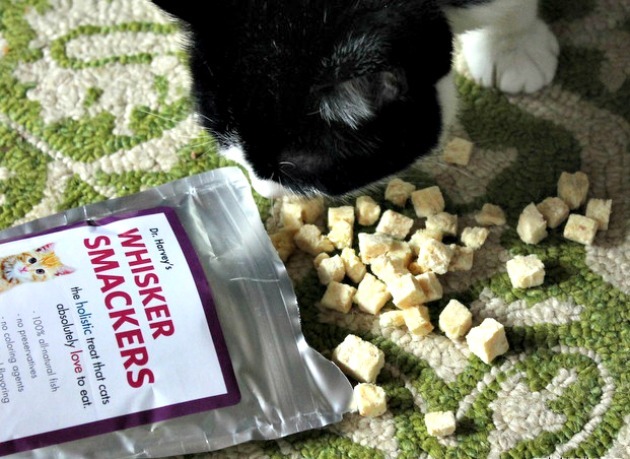 We received a variety of products from Dr. Harvey’s, but the favorite for my girls by far were the Whisker Smackers. This snack is filled with freeze dried beef or fish (we got fish) and the cats loved it. They ate the heck out of this and I had to literally grab the bag from Meep because she growled at me when I tried to take it! You can find another very healthy and delicious treat for your cat or dog in the Power Patties, which is freeze dried tripe. Be sure to browse through their Veg-To-Bowl, Oracle and other healthy foods as well as the line of supplements for your animal companion. One USA reader will win 2 packs of the Power Patties for their pup $26. 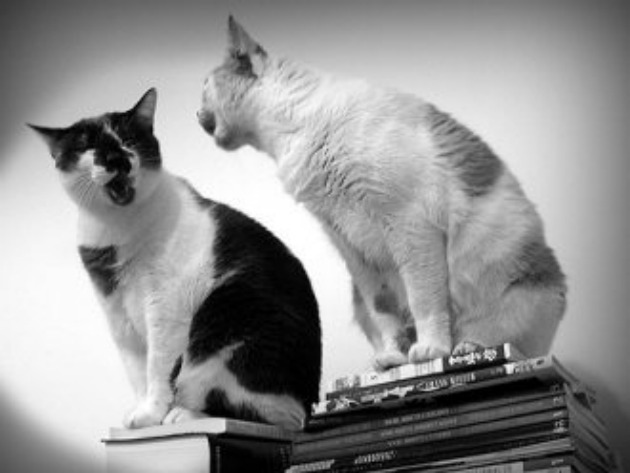 If your cat could talk, what would he or she say? Previous articleWacky Wednesday Weekly Coffee Sale! My cats would say-give the dogs back! This is so cute! I don’t have cats, but I do have 2 dogs. I can only imagine the things they must be saying to me. Our cat is SO crazy, I could totally see her doing stuff like this. She is getting lazy now that her kitten phase is passing. This is so cute, I have a dog but I get the point!